From the luxury division of the world’s biggest recreational boatbuilder comes this blend of attractive styling and lively performance. Like you, I’ve spent a lot of time touring one new boat after another at local shows, and one of my favorite parts of the dock-walking ritual is the rare “Aha!” moment. That is, when you find yourself in a space that looks and feels just right. 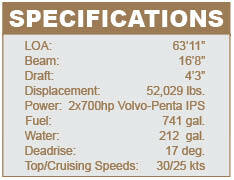 With a pair of Volvo-Penta 700-hp diesels powering IPS drives, the Prestige 60 is fast and maneuverable. I had one of those when I stepped into the cool and very contemporary saloon of the Prestige 60 on a hot day during a busy show in the Northeast. Enjoying the moment, I stood for a while in this very big and bulkhead-free entertaining area with its oversized windows and chic leather furnishings. During that time, I watched other people come and go, and realized they too had the same impression. There were raised eyebrows, nods all around, and then eventually a hand on my elbow as a salesman gently tried to propel me down to the forward accommodations so others could explore this distinctive space. 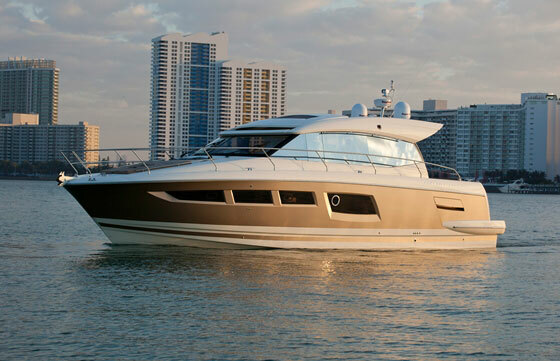 Most people gravitate to flybridge yachts for the opportunity to have more entertaining space on the outside. 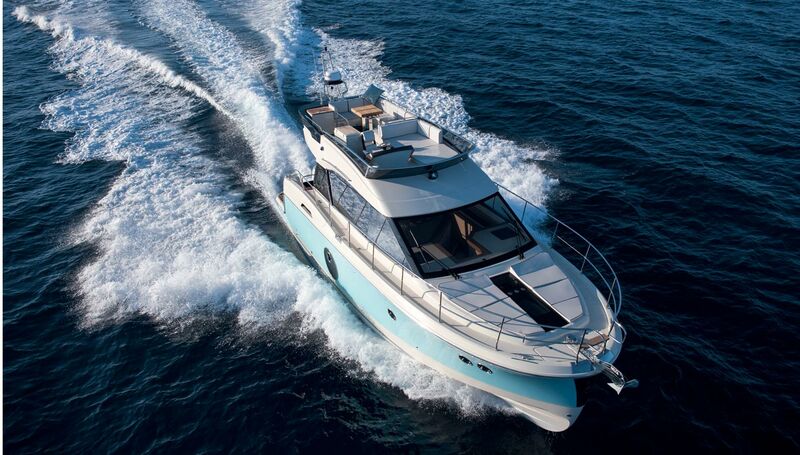 The Prestige 60 has that too, but the single-level saloon that looks and feels more like a pristine penthouse could encourage guests to spend time inside. There are a few surprises here, too, including the galley that’s set at the aft end of space. Here, it’s close to the saloon’s dining area with its slick high/low table, and also adjacent to the cockpit—another excellent spot to break bread thanks to a handsome wood table, bench seat, and flybridge overhang for sun protection. 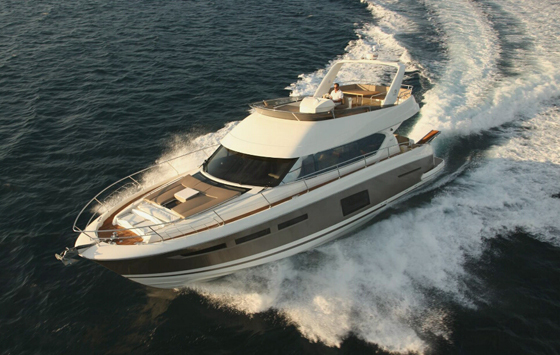 Prestige is a yacht division of The Beneteau Group. 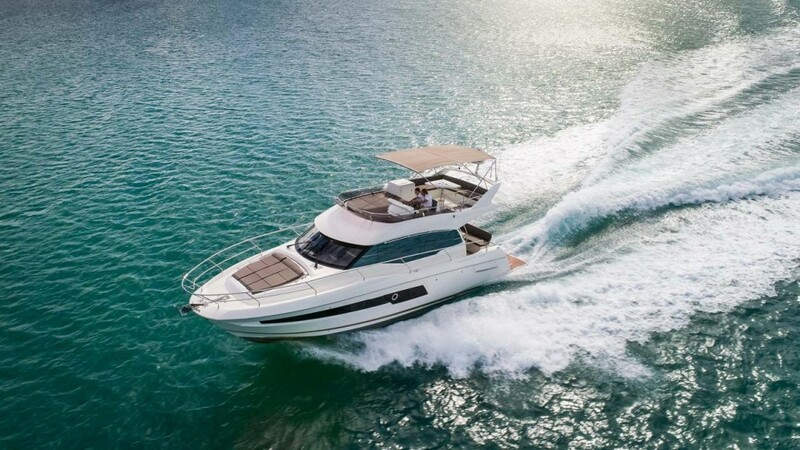 Those of you with keen memories may recall that just a few years ago, Prestige was the powerboat line offered by sailboat builder Jeanneau, also a Beneteau company. 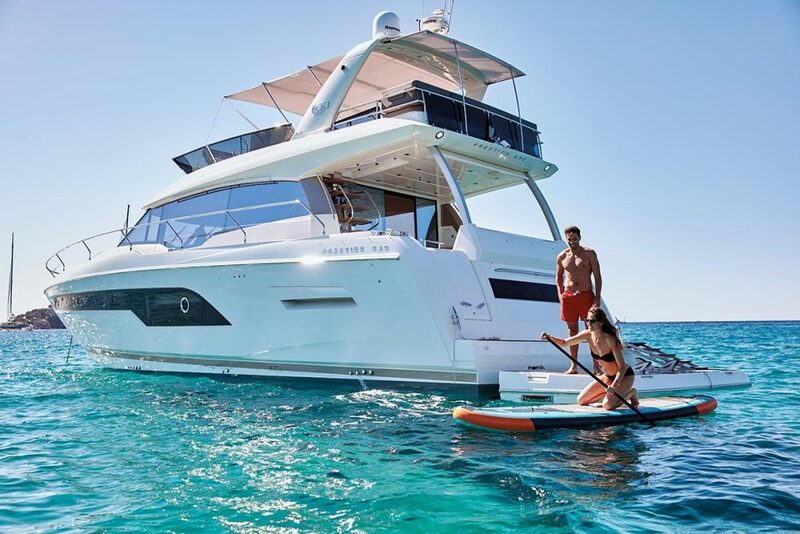 Recently, Prestige was set apart from the makers of wind-powered craft and is now marketing a series of cruisers starting at 35 feet. 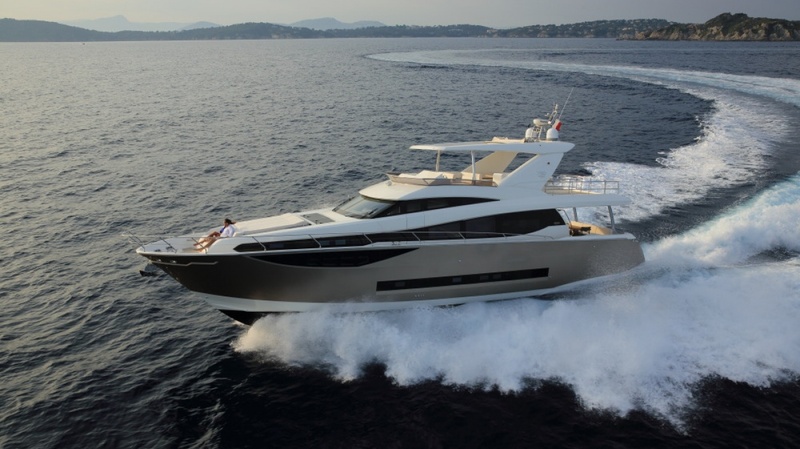 While the midsize models have created buzz, this 60 could be the yacht that makes this brand a well-known name in the States. 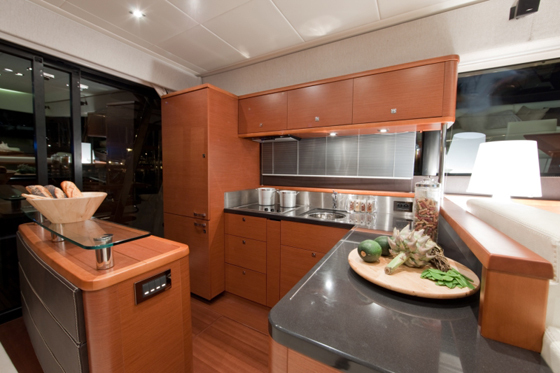 The saloon on the Prestige 60 is wide open, well-lit, and comfortable, providing galley access both inside and on deck. I tested the 60 a few days after that show, at Total Marine in Norwalk, Connecticut, where it was being prepped for delivery to its new owner, a semi-retired businessman from Brazil who now keeps the boat at his second home in Florida. As it turns out, he had his “Aha!” moment when he saw the smallest of the three staterooms on board. With two bunks, he thought the room would be ideal for his two grandchildren. In fact, he traded up from his Prestige 42 specifically to accommodate the needs of his growing clan. For all its comforts, the 60 is a slick performer. It has the get-up-and-go of a sports cruiser and the smooth handling of a motor yacht, and that’s in part due to the hull by naval architect Michael Peters. No stranger to boat design, Peters has been hard at work for 30 years and has an impressive portfolio that ranges from production boats to tournament fishing machines and luxury yachts. His designs have staying power, too: One of his 165-mph catamarans just won its 15th world championship. Peters designed the 60 specifically for a pair of 700-hp Volvo IPS 900 diesels. 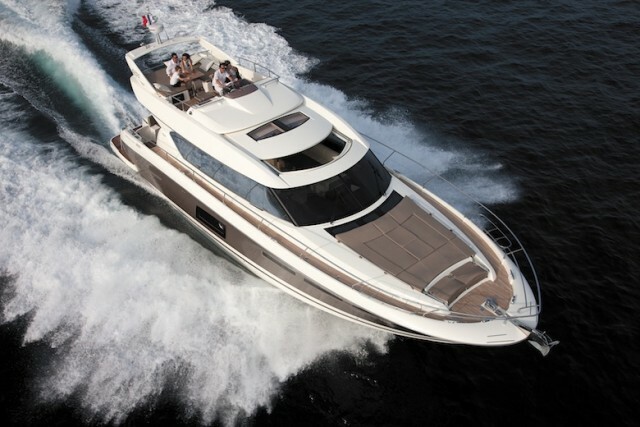 The engines will push the boat to a cruising speed of 25 knots and a top end of 30 knots. Like all IPS-powered boats, this one boasts joystick control, which continues to attract fans with its immediate reaction, particularly when it comes to maneuvering in tight places. Although it’s not listed on the equipment list, Volvo’s Dynamic Positioning System (DPS) is offered on the 60, and it was installed on the boat I ran. With it, you can hold the boat on station. This comes in handy when waiting for a bridge to open or for docklines to be secured. At the heart of DPS is an antenna with two GPS receivers that pinpoint the boat’s location. This data is sent to software that instantly adjusts the engines’ rpm and the position of the pod-drives to keep the boat where you want it to stay. 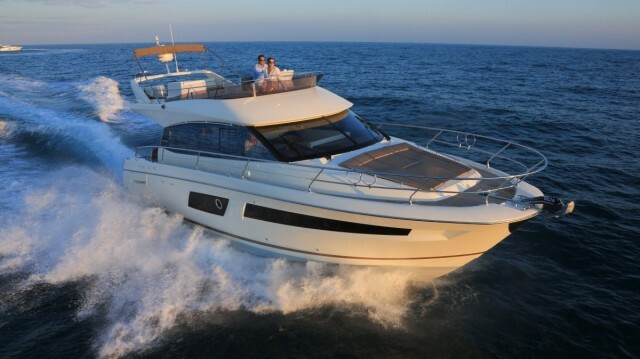 Even with DPS, this luxury flybridge cruiser is priced competitively at $1.4 million. The builder achieves the attractive bottom line a few ways. The parent company buys materials in volume, and many of the boat’s features are standardized to optimize build time and keep costs low. In the end, the 60 is produced with the equipment necessary for safe and reliable turnkey operation, yet the owner doesn’t have to pay for features that won’t be used. So if the sophisticated saloon, family-friendly accommodations, or sporty performance don’t wow you, maybe the price will. 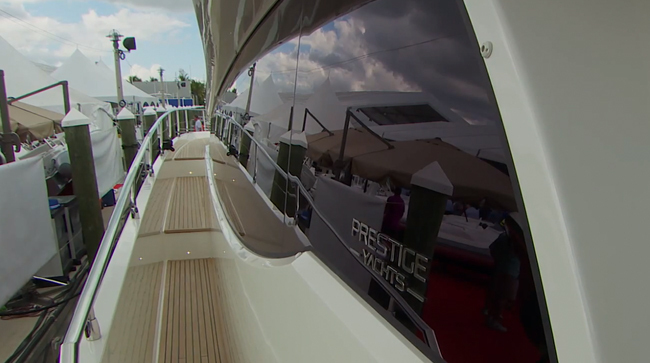 For more information, contact Prestige Yachts.